Chinese archaeologists have found a pot of eggs in a tomb that can be dated back to 2,500 years ago in Changzhou, Jiangsu province. 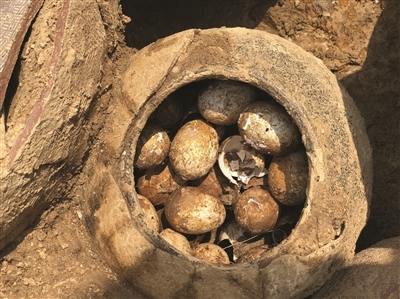 According to a report by jschina.com.cn, the eggs were found in a clay pot along with other pottery containers, cookers and plates in a mound tomb in Shangyang Village. Different from similar excavations earlier, the eggs unearthed this time were clearly separated from each other, making them easier for experts to clean, according to Lin Liugen, head of the Institute of Archaeology Nanjing Museum. The pot of eggs will now be put in a cabinet with a stable temperature and humidity for further study. It is not clear at present if the eggs were from domestic chickens or pheasants. Archaeologists noted that cereal products could have been contained in other potteries but they perished over time.